Environmental concerns about natural adhesive materials are leading to an increasing interest towards the development of ecological products. The development of new value-added uses for wheat proteins led us to develop protein-based wood adhesives. Different protein cold-setting resins were formulated by reacting the protein hydrolysates with different aldehydes (formaldehyde, glyoxal and glutaraldehyde). 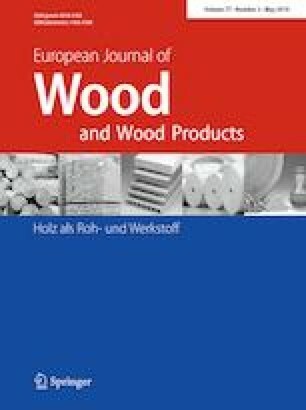 Wood bonded with cold-setting protein adhesive with different aldehydes met the requirements for interior and exterior conditions, and the characterization was similar to those of conventional PRF (phenol–resorcinol–formaldehyde) adhesives. As the results indicate, both glyoxal and glutaraldehyde are able to react with wheat protein hydrolysates and are viable alternatives to formaldehyde and prospectively seem more environmentally friendly. Matrix-assisted laser desorption ionisation time-of-flight (MALDI-TOF) analysis allowed the identification of the main oligomer species obtained. The analysis showed that resin prepared with glutaraldehyde is not a simple mix of resorcinol–glutaraldehyde oligomers and amino acid, but a much more complex combination of various species including amino acid-glutaraldehyde and amino acid-resorcinol oligomers.